Marcos Coll was born Madrid in 1976 but moved with his family to Santiago de Compostela, in the northwest of Spain. He started playing the harmonica at the age of 13, influenced by his musician uncle and by Spanish blues harp legend Ñaco Goñi. In 1999 Coll moved back to Madrid to join the most famous Spanish blues band at that time, Tonky Blues Band. This gave him the opportunity of touring and recording with Mick Taylor (Rolling Stones), Buddy Miles (Jimmy Hendrix) and playing a blues gig with Tom Jones. 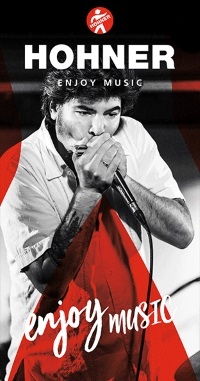 With his own band Los Reyes del KO (The Knockout Kings), Coll soon became one of the top blues players in Spain and Europe, earning awards and sharing bills with several all-time greats, including Buddy Guy, Johnny Winter, Chuck Berry, John Mayall, Solomon Burke, the Animals, Robert Cray and the Fabulous Thunderbirds. 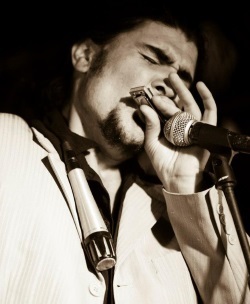 In 2004 Marcos Coll moved to Berlin, where he soon became part of the blues scene in the German capital. As an endorsee of Hohner harmonicas, in 2009 and 2013 Coll performed, taught and was a juror at the World Harmonica Festival, held every four years in Trossingen, Germany. Nowadays, Coll often works with legendary bluesman Guitar Crusher, as well as with his Mexican Latino music band Los Mighty Calacas, which has toured all over the world and has released a CD featuring guests such as Charlie Musselwhite. Coll’s own double album Under the Wings is a mixture of classic blues, modern funk, Latin and hip hop, which looks back over a 20-year career and includes recordings with Buddy Miles, Mick Taylor, Aaron Burton and more. Coll has toured Under the Wings in Europe, America, Asia and Africa. Marcos will be leading a workshop for our intermediate and advanced players, and joining Fede Vaz in our afternoon masterclass.